Ok, I haven't been to Albany/Schenectady, NY since 1989. I was road geeking then but not taking pictures. So I plan on going up in 2 weeks or so. Any goodies such as original shields, non-reflective button copy, embossed goodness? Region 1 isn't a friend to old things, so there's not much there. The remaining button copy seems to be confined to US 9 near Latham Circle, a gore sign on I-87 south at I-90, and Thruway exit 24 getting on just past the toll plaza. I-87 south approaching I-90 does have an old lighted gantry though, and there are some light-up signs on I-87 north through these interchanges. There is a non-cutout interstate shield on Forts Ferry Rd if you exit the mall at the RIRO just after it splits off NY 7. 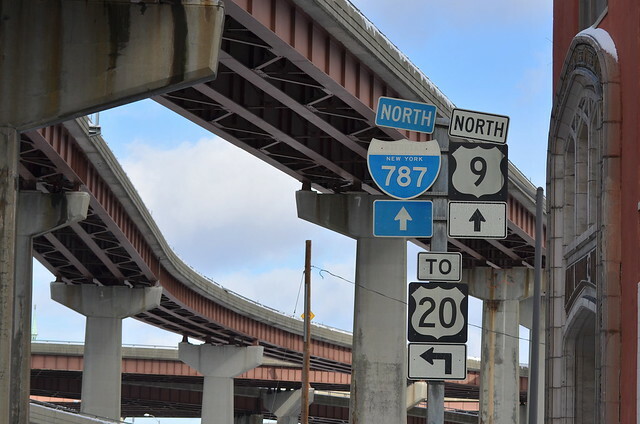 There's also an I-787 south reassurance marker on the bridge leaving Troy, which is interesting because the I-787 designation on NY 7 has been hidden ever since NY 787 was built. -First off, the Albany area has a ton of old 4-way signals all around (US 20/Madison Avenue for example). If you're interested in exact locations, let me know. -Very old NY 5 shield complete with "NY" up top on Church Street in Schenectady. 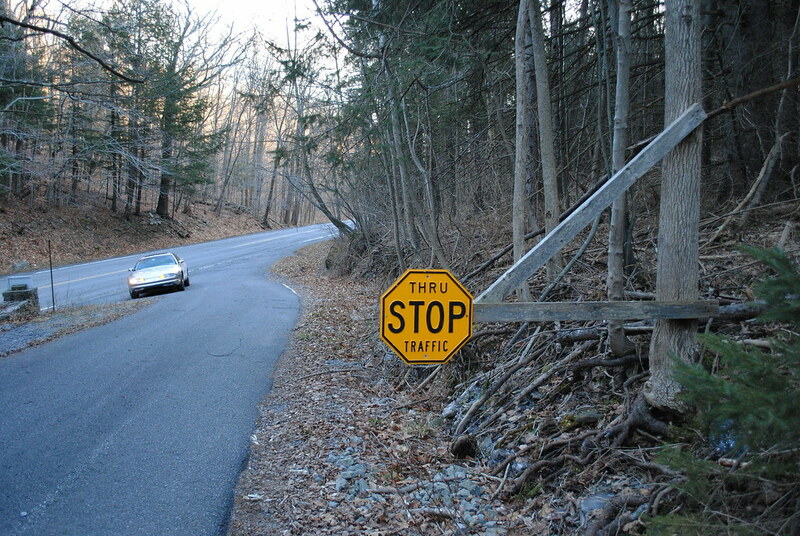 -There are a decent amount of old NYSDOT curve signs with the tapered arrow. NY 146, NY 378, NY 157A, and NY 335 just to name a few roads that have them. -There's a driveway off of NY 85 near its end in Rensselaerville that is this really cool REPAINTED embossed yellow STOP sign. 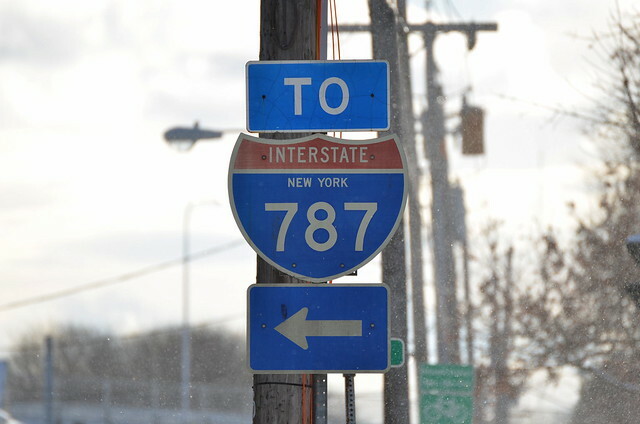 -There's quite a bunch of state-named I-787 shields around. Here, here, here, here, and here are a few good examples. -There are a lot of old NYSDOT font route shields all across the area as well. Here, here, here, and here are a few examples. 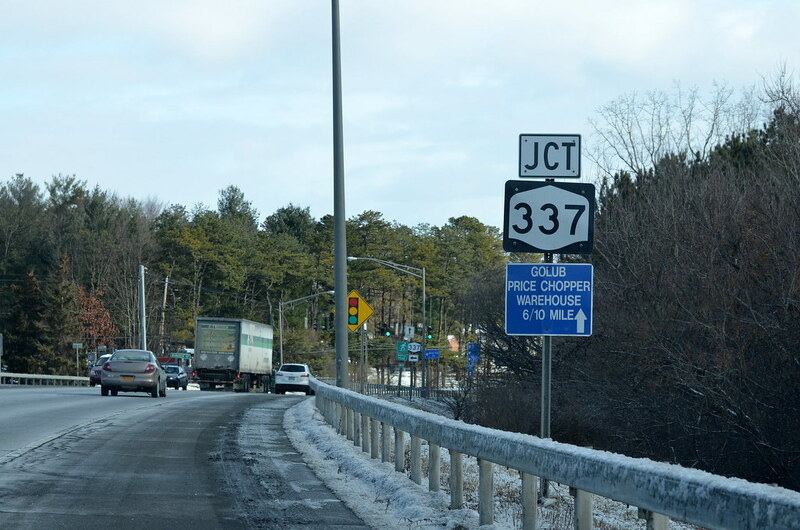 -NY 337 in Rotterdam has a few upside down error shields. At least a couple of those state-named I-787 shields have been replaced since the street view car went through. NYSDOT underwent a massive sign replacement program after Cuomo was elected, and the street view in the capital region dates to 2011. A LOT of older signs across the state disappeared in the last couple years. Must've been in the last year and a half or so, because I photographed these ones in late December 2012. Do we know if these are still there? Thanks for the detailed replies. I'm hoping to get up there next week. I also want to get the NY-5 named shield too. Too bad about that one. The older ones were still doing their job. Looks like things are more interesting south of Albany than north. Lots of old reference markers, all-text warning signs, NY 144 shields with a strange font, NY 9W shields, and every sign coming in to New Scotland is white on blue. cool where's the text warning signs? Quite a few places. The text "stop ahead" signs are everywhere. NY 396 and Feura Bush Rd (reference route) are good candidates. Yesterday morning I essentially covered every touring route in southeastern Albany County except for a couple segments that I've already seen. Any old I-88, I-90 or I-87 state namers around? 57 or 61 specs? If you're willing to go 30 miles to the west of Albany, we have some pretty old overhead signs on the New York 30 bridge over the Mohawk in Amsterdam and nearby on New York 5. Fortunately, many of these survived the big sign replacement that was needed last year when parts of the NY 5 westbound arterial and a block of Church Street just off the bridge were converted from one-way to two-way traffic patterns. The I-88 state name shields are west of Oneonta. No state named I-90 shields around Albany, to my knowledge. There are a few state named I-87 shields lurking around in Halfmoon, in southern Saratoga County.